Rapid growing cells like tumor cells need a vast amount of energy to match their high metabolic demand. Guanine triphosphate (GTP) is one of major cellular metabolites and served as a building block for RNA and DNA as well as an energy source to drive cellular activities such as intracellular trafficking, the cell migration and translation. However, how cancer cells regulate GTP energy levels to adapt for their high demand remain largely unknown yet. In addition, how cells detect GTP levels remains unknown. 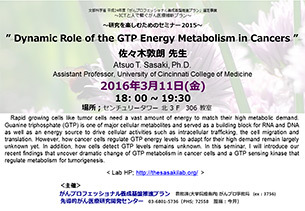 In this seminar, I will introduce our recent findings that uncover dramatic change of GTP metabolism in cancer cells and a GTP sensing kinase that regulate metabolism for tumorigenesis. Copyright © 2012 がんプロフェッショナル養成基盤推進プラン All Rights Reserved.